ferrous carbonate, magnesium hydroxide, calcium chloride, biotin. Feeding Directions: Feed Enduro Complete at a rate of .5% to 1% of total body weight depending on body condition and activity level. Provide clean fresh water and a good salt-mineral free choice. Can be fed as a sole ration or with pasture, hay, or hay cubes. Balanced nutrition for horses of all life stages. From bred mares to growing foals, to highly active working horses, to recreational horses, or long loved seniors. 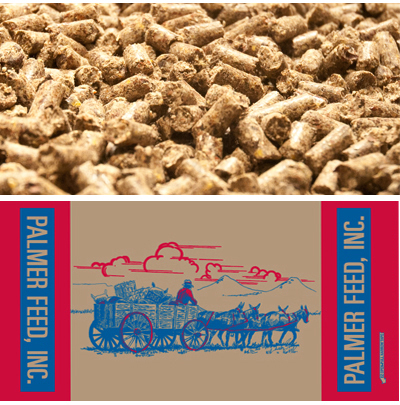 Highly palatable pellet to increase digestibility and decreased sorting. Lowered starch and sugar content may help with gastrointestinal problems and possible effects of overfeeding. Increased fat helps with a shiny coat and overall body condition. Recommended to be fed with high quality pasture or forage. Ingredients:Forage products, beet pulp, processed grain by-products, plant protein products, vegetable oil, grain products, cane molasses, calcium bentonite, calcium carbonate, rice bran, salt, L-lysine 95%, lignin sulfonate, vitamin E supplement,roughage products, mineral oil, dried lactobacillus acidophillus fermentation product,dried lactobacillus lactis fermentation product, dried lactobacillus plantarum ferm- entation product,dried enterococcus cremoris fermentation product, dried ente- rococcus diacetilactis fermentation product, dried b-subtillis fermentaion product, dried aspergillus oryzae fermentation product, dried brewers yeast, distillers dried grains with solubles, dried yeast, flavor ingredients, butylated hydroxytolune (a preservative), calcium silicate, vitamin A supplement, vitamin D3 supplement, zinc methionine, manganese methionine, copper lysine, cobalt glucoheptonate, copper amino acid complex, roughage product, distillers dried grain with solubles, biotin,ferrous carbonate, zinc oxide, manganous oxide, copper oxide, calcium iodate, cobalt carbonate. Begin with the recommended rates according to your horse’s weight.Observe your horse and adjust feeding rate to achieve desired weight and body condition. Feeding rates may vary per animal.Rates may vary from 1/3 to 2% of the animal’s body weight per day. 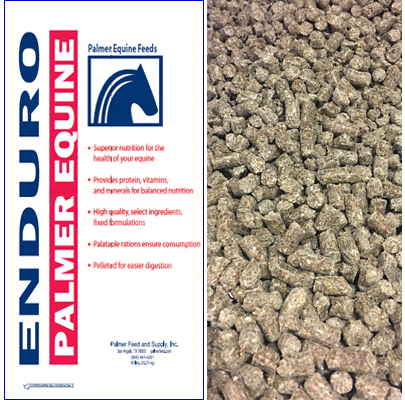 Do not feed less than .33 lbs per 100 lbs of body weight per day.If your horse gains too much weight at that minimum rate, consider switching to Palmer’s Enduro Fiber Plus or Enduro Grains Plus. 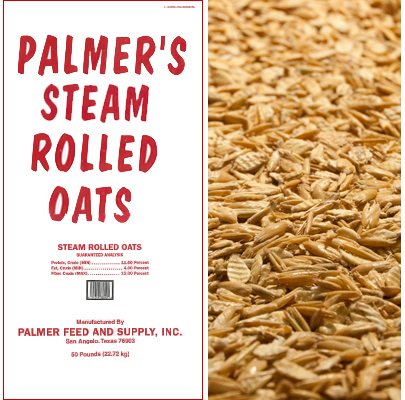 * Recommended to feed a minimum of 1-1.2% of the body weight of good quality hay or pasture. Make feed changes gradually over a period of 7 to 10 days.Feed at regular times, preferably at least 2 times per day. Do not feed free-choice.Provide plenty of fresh, clean water at all times. Grain products, plant protein products, calcium carbonate, rice bran, dicalcium phosphate, monocalcium phosphate, salt, cane molasses, cobalt carbonate, mineral oil, vitamin A supplement, vitamin D3 supplement, vitamin E supplement, roughage products, calcium sulfate, magnesium hydroxide, calcium chloride, sodium salts of fatty acids, sodium pyrophosphate, potassium hydroxide, iron oxide, vegetable oil, soybean oil, propionic acid, acetic acid, benzoic acid. Horses: Feed to horses with adequate roughage or pasture. Note: Provide plenty of fresh, clean water at all times. Specifically formulated to provide the nutrients needed for maintenance and conditioning during varying stage of activity in: show horses, performance horses, growing horses, stallions, and brood mares. Grain products, plant protein products, calcium carbonate, rice bran, dicalcium phosphate, monocalcium phosphate, salt, cane molasses, cobalt carbonate, mineral oil, vitamin A supplement, vitamin D3 supplement, vitamin E supplement, roughage products, calcium sulfate, magnesium hydroxide, calcium chloride, sodium salts of fatty acids, sodium pyrophosphate, potassium hydroxide,iron oxide, vegetable oil, soybean oil, dried lactobacillus acidophillus fermentation product, dried lactobacillus lactis fermentation product, dried lactobacillus plantarum fermentation product, dried enterococcus cremoris fermentation product, dried enterococcus diacetilactis fermentation product, dried b-subtillis fermentaion product, dried aspergillus oryzae fermentation product, dried brewers yeast, distillers dried grains, zinc methionine complex, manganese methionine complex, copper lysine complex, cobalt glucoheptonate, propionic acid, acetic acid, benzoic acid. Feeding Directions: The following guide should be followed according to your horse’s age and classification. Start with the amount of feed shown for your horse’s weight. Observe your horse over a period of time and, if necessary, adjust the feeding rate to maintain desired body weight. Feed may need to be increased or decreased up to 10% according to each horse’s needs. Make all feeding changes gradually (7 to 14 day period). Feed at regular intervals, at least two times daily. Equine Performance should be fed with good, quality alfalfa or grass hay. Fresh, clean water should be provided at all times, except to hot horses. It is essential to maintain an effective parasite control program. Be sure horses are free from dental problems. Observe your horse’s daily condition, and consult a veterinarian if problems arise. *Examples are horses used in Western and English pleasure, equitation, etc. **Examples are horses used in ranch work, roping, barrel racing, jumping, etc. ***Examples are race training, polo, etc. Feeding Directions: Feed to horses with adequate roughage or pasture. Note:Provide plenty of fresh, clean water at all times. Ingredients: Grain products, forage products, roughage products, beet pulp, processed grain by-products, plant protein products, cane molasses, calcium bentonite, calcium carbonate, salt, lignin sulfonate, vitamin A supplement, vitamin D3 supplement, vitamin E supplement, mineral oil, dicalcium phosphate, monocalcium phosphate, ferrous carbonate, zinc oxide, manganous oxide, copper oxide, calcium iodate, cobalt carbonate, zinc methionine, manganese methionine, copper lysine, cobalt glucoheptonate. Feeding Directions: Feed 1 1/2 lbs per 100 lbs body weight per head per day. Provide clean fresh water and a good salt-mineral free choice. grains with solubles, zinc oxide, manganous oxide, copper oxide, calcium iodate, cobalt carbonate, zinc methionine complex, manganese methionine complex, copper lysine complex, cobalt glucoheptonate, distillers dried grain with solubles, biotin. Begin with the recommended rates according to your horse’s weight as a guide. Observe your horse and adjust feeding rate to achieve desired weight and body condition. Feeding rates may vary per animal. Rates may vary from 1/3 to 2% of the animal’s body weight per day. Do not feed less than .33 lbs per 100 lbs of body weight per day. 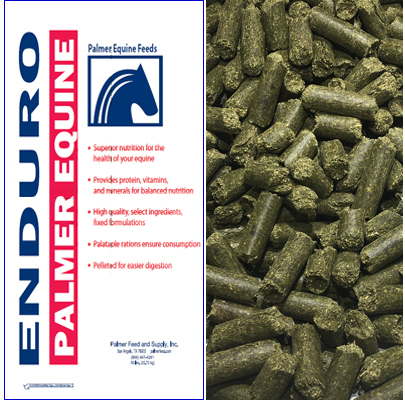 If your horse gains too much weight at that minimum rate, consider switching to Palmer’s Enduro Fiber Plus or Enduro Senior. * Feed at regular times, preferably at least 2 times per day. Provide plenty of fresh, clean water at all times. Ingredients: Grain products, processed grain by-products, forage products, rice bran, cane molasses, plant protein products, calcium carbonate, calcium bentonite, wheat bran, lignin sulfonate, salt, grain products, calcium carbonate, dicalcium phosphate, monocalcium phosphate, sodium chloride, zinc sulfate, vitamin A supplement, selenium, red iron oxide, degummmed soybean oil, ethoxyquin (preservative), vitamin E supplement, roughage products, mineral oil, linseed meal solvent, vitamin D3 supplement, dried streptococcus faecium fermentation product, dried lactobacillus acidophilus fermentation product, yeast culture (live saccharomyces cerevisiae grown on a media of ground yellow corn, diastatic malt and cane molasses), dried aspergillus niger fermentation extract, dried aspergillus oryzae fermentation extract, dried bacillus subtilis fermentation extract, beta glucan (encapsulationg agent), manganese methionine, zinc methionine, corn gluten meal, distillers dried grains with solubles, menhaden fish meal, urea formaldehyde condensation polymer (pelleting aide), silica, flavor ingredients, butylated hydroxytolu, precipitated chalk, calcium sulfate, ferrous carbonate, magnesium hydroxide, calcium chloride, sodium salts of fatty acids, sodium pyrophosphate, locust bean gum, karaya gum, potassium hydroxide, hydrogenated tallow glycerids, orange oil, zinc oxide, manganous oxide, copper oxide, calcium iodate, cobalt carbonate, manganese methionine, copper lysine, cobalt glucoheptonate. Feeding directions: Horses: Feed to horses with adequate roughage or pasture. Note: Provide plenty of fresh, clean water at all times. Ingredients: Oats, propionic acid, water, ammonium hydroxide, sorbic acid, benzoic acid, phosphoric acid, propylparaben, methylparaben, BHA. The course outer covering of the wheat kernel separated from cleaned and scoured wheat. Sugar Beet Pulp Shreds is a co-product of the sugar beet industry, and offer a valuable feed resource for all types of livestock. Sugar beet pulp shreds are the fibrous portion of the sugar beet left after the sugars are removed, and is mechanically pressed and dried to reduce the water content to approximately 9%, Sugar beet pulp fiber is highly digestible, extremely palatable feed in a form that is considered less dusty than hay. For young orphaned foals, foals weaned prior to 2 months of age, and foals nursing mares with inadequate milk supply. Mix 1 cup (8oz) of powder with 3 cups of warm water. This yields approximately 1 1/2 pints of milk replacer. Feed up to 18 pints of milk replacer daily, divided into 2-8 feedings per day. 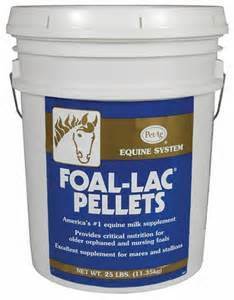 Stimulates the nutritional composition of mare's milk. Easy to mix with water. 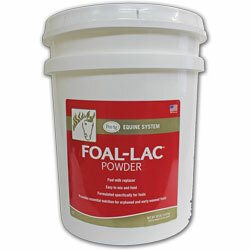 For early weaned foals, and for nursing foals before and during weaning. Excellent supplement for gestating/lactation broodmares and breeding stallions. 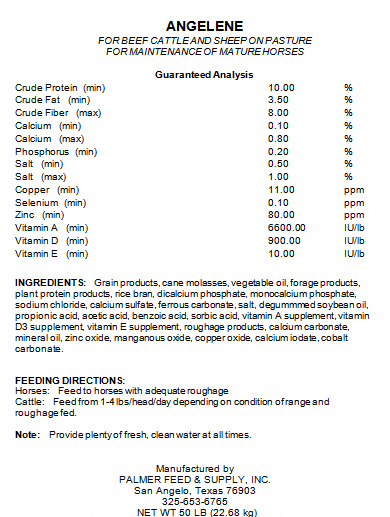 Balanced protein and other essential nutrients for growth in foals, as a supplement. Easily mixed into foal's ration, no waste.